Winter Pool Covers for In Ground Pools. We have Mesh Covers, Winter Covers, Safety Covers, Leaf Nets and Economy Covers. We have the right cover for your pool. If you dread cleaning the leaves, dirt, and debris from your swimming pool each time Spring comes around, then you should consider a Winter Pool Cover for your in ground pool. We carry a large selection of In Ground Pool Covers at the right prices to meet your pool cover needs. We offer sturdy economy winter covers as well as high quality and durable Arctic Armor, PoolTux and Armorkote pool covers. 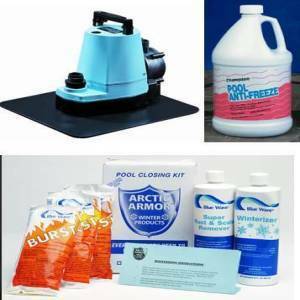 Read more about how to Winterize Your In Ground Pool with these handy guidelines. 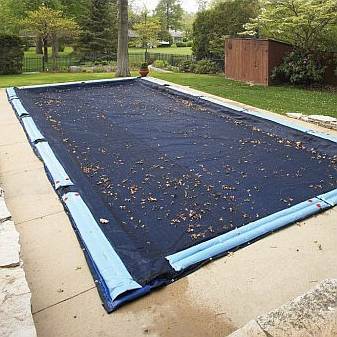 Pool Pro Tip: When ordering a winter cover, you order according to the size of your pool. For example if your pool is 16 x 32 then you click on your pool size and order a cover from that page. The actual cover size will be 5 feet bigger in length and width. If your pool has steps that stick out from your pool then you would need to add on that measurement before choosing your size. For example if your pool size is 16 x 32 and you have a 4x8 step on the end then you would add the 4 feet to your length and choose an appropriate size. If there is not a category for your exact size then you should choose the next largest size available. It is much better to have a cover that is too big rather than too small.